And just like that it is autumn! Welcome all things cozy, warm-to-the-soul, and spiced. Hi friends! I was gone all of last week but today we are back and better than ever, ready to share this delicious all-things-autumn recipe. This recipe is perfect for this time of year - roasted eggplant that is deliciously stuffed with quinoa, mushrooms, multi-colored carrots, and spiced up with different herbs like rosemary, sage, and basil. ahh I can smell autumn cookin' in my kitchen, can you?! This meal is full of cozy autumn flavor, lots and lots of healthy goodies, and topped with a guilt free super simple cashew sauce on top. Yum. 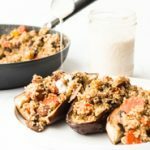 This stuffed roasted eggplant is a perfect meal for your Thanksgiving or friendsgiving celebration (if that's your thing), or for any fall weather get-together you may be hosting this holiday season. As usual this recipe is very flexible and adaptable. Feel free to use wild rice or brown rice instead of the quinoa, or add/subtract whatever veggies you feel inspired to include or remove. Also this recipe, as all other recipes on this website, is refined oil free!!! Okay foodies that is all - and pardon my absence last week, I was out in the mountains for enjoying the beautiful fall foliage. Can you blame me? Want to see more awesome vegan dinners? Check out this healthy homemade oil free quinoa (not) fried rice or if you are into pasta check out this vegan zucchini noodles with arugula alfredo sauce recipe. 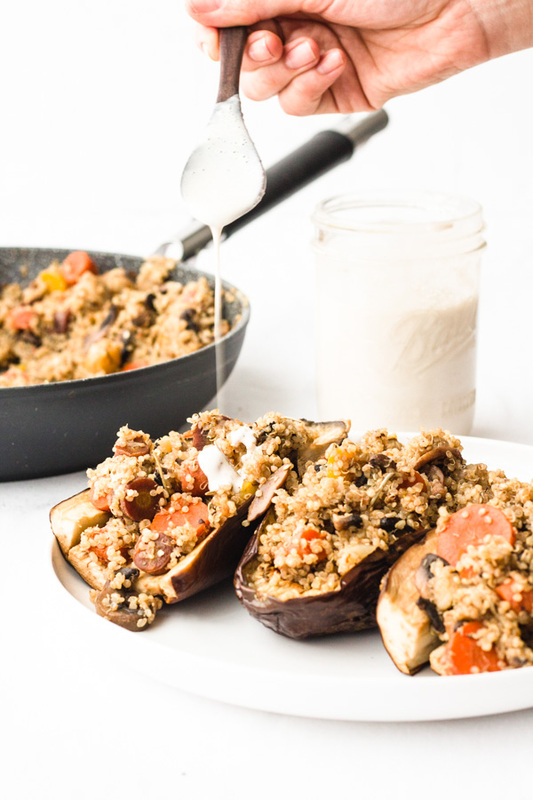 Vegan stuffed roasted eggplant with quinoa, mushrooms, and multi-colored carrots topped with a simple cashew sauce. Oil free and gluten free. Place eggplants face down on a baking sheet covered with parchment paper, coat with around 1/2 cup of vegetable broth and roast in the oven for 35 minutes. Check eggplants around the halfway mark and sprinkle more veg broth on top if they seem really dry. Add mixed carrots and mushrooms to a saucepan, add 1/2 cup of vegetable broth, and cook over low/medium heat until soft. Chop up the rectangular pieces of eggplant flesh into cubes and add these to the saucepan once carrots are semi-soft (around the 10 minute mark). I like to add eggplant pieces last because eggplant cooks much faster than the carrots. Once all veggies are soft and tender, and most of the veg broth has evaporated (within 15 to 20 minutes).. add 2 cups cooked quinoa to the saucepan and mix to combine (if you don’t have cooked quinoa already – use this blog post for details on how to cook fluffy quinoa). Add the spices at this time – salt, basil, sage, rosemary, and cinnamon. Mix to combine. Once eggplants have roasted in the oven – remove, flip them over, and stuff with the quinoa/mushroom/vegetable mix. You can serve them just like this or if you want to take it one step further you can make a quick oil free simple cashew sauce to drizzle on top by blending cashews, garlic, miso, water and salt. Drizzle on top and serve. Enjoy!